DON’T LET YOUR WINE WILT! It’s that time of year again! Temperatures are climbing and we’re all looking forward to that first dip in the swimming pool. But as much as we like the warm weather, your wine is another story. 1. Heat kills wine. Make sure your wine is stored in an area that doesn’t get much above 70 degrees. And during the dog days of summer, it’s especially important to protect your wine from overheating. 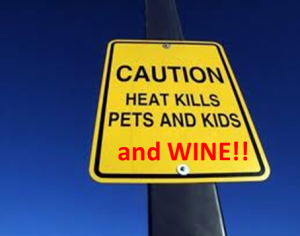 Fifty-five degrees is the optimum temperature for wine. 2. Keep the temperature steady. Temperature fluctuations of more than 10 degrees can be more harmful than keeping the wine at a higher than recommended, but steady, temperature. 3. Older wines (more than 10 years) are more fragile than younger wines and are susceptible to spoilage if storage conditions aren’t right. Fine wines that are built to age are usually expensive, so you’re putting your assets at risk if you don’t store them properly. 4. Avoid strong light and vibration. The kitchen is out unless you have a wine fridge and even then you may subject your wine to more vibration than is healthy. One last thing about home wine coolers: The rule of thumb is never put them in an area where the temperature climbs 30 degrees above the temp you have the cooler set to. For example, if you have the thermostat set to 55F, the temp in the room shouldn’t get above 85F or you will strain the cooling unit and risk a blowout. So forget the garage during the summer as it will get hotter than any other room in the house. Garages are great places to store lawnmowers, but not wine.